I see the World Snooker Championships are on at the moment...if the internet was around back when I was in school, there’s as much chance of me harping on events at the Crucible as there would have been Lansdowne Road. Not sure I had a particular favourite player, but if there was ever one guy I’d have loved to see win in Sheffield, it was Jimmy White. Six finals, including an agonizing five in a row, with no titles. The reason I reference the assorted near misses of “The Whirlwind” is that I want to point out the biggest thing Leinster are up against this weekend in Lyon. It has been an awesome season for us so far, much better than I expected, that’s for sure. Sending all kinds of records tumbling in the Guinness Pro12, home semi clinched with two games to spare, topping our Euro pool with a home quarterfinal which we then made look much easier than it should have been. And all of this was achieved while introducing a host of young talent to the senior ranks without skipping a beat. But what we face on Sunday is not just a quality Clérmont side packed with experience and talent. And it is not just the task of winning in France, something that may have eluded us twice already this season but certainly hasn’t always stumped us through history. No, I believe our challenge to be much more abstract. Remember how we felt going to Croker back in 2009 around this time of the year? It was also right after the Lions squad had been named. We were rightly sick of this “sleeping giants of European rugby” tag and we were desperate for a chance to wake up. Take that feeling, and ramp it up by about 8 years. And what’s more, throw in the fact that Les Jaunards have actually been to a couple of finals and should have won at least one of them and you’ll come close to understanding just how big this match is for them and their fans. Maybe French clubs are known for a touch of European indifference, but certainly not this one. To visit the stadium on a match day is a sporting experience never to be forgotten, and such is the fanaticism of the Yellow Army, as the Clermont fans call themselves, that their allocation of 22,000 tickets for Sunday’s semi-final in Lyon were gone within eight hours. Am I building up to a prediction that we are doomed to failure before we begin? Absolutely not. We have showed again and again this season that we can produce results in numerous different conditions...home or away, good weather or bad, and often it hasn’t even mattered if we were playing well or not - the wins seem to just keep on coming, so we are well able to get another one this Sunday. When it comes to our selection, our coaches have an embarrassment of riches to choose from at pretty much every position, even when big names like Heaslip, O’Brien and the Kearneys are unavailable. If there was one selection that gave me surprise it was that of Ross Byrne on the bench. Before I get lynched by the St Michael’s past pupils union, I have nothing against the player, he has done extremely well. 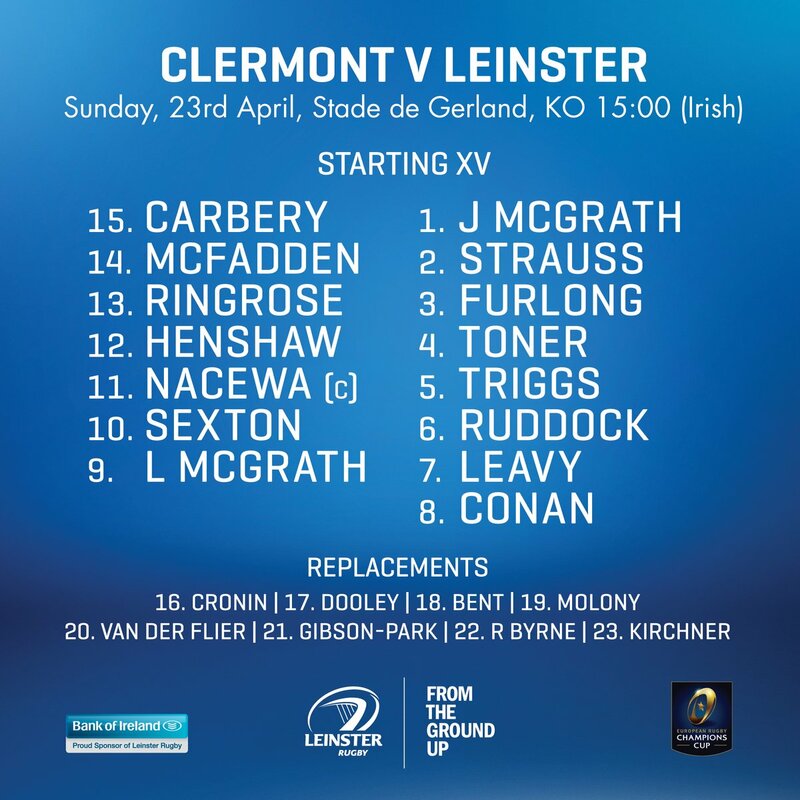 I just thought perhaps Joey Carbery was a suitable replacement for Sexton so perhaps the 22 jersey could have gone to someone like Noel Reid who could cover the centre. But who am I to question a coaching staff that has gotten it right so many times this season? We'll need our defence to be every bit as strong as it has been. Not for the first time in my previews this season, as effective as both Robbie Henshaw and Garry Ringrose can be going forward, it's in their tackling channels where I see our hopes resting. And in yet more repetition for these posts, I am going to say as little as I can about how well our scrum has done for fear of jinxing it. Just long may it continue. But generally it is in the forwards where we will need to dominate this contest as early as possible. 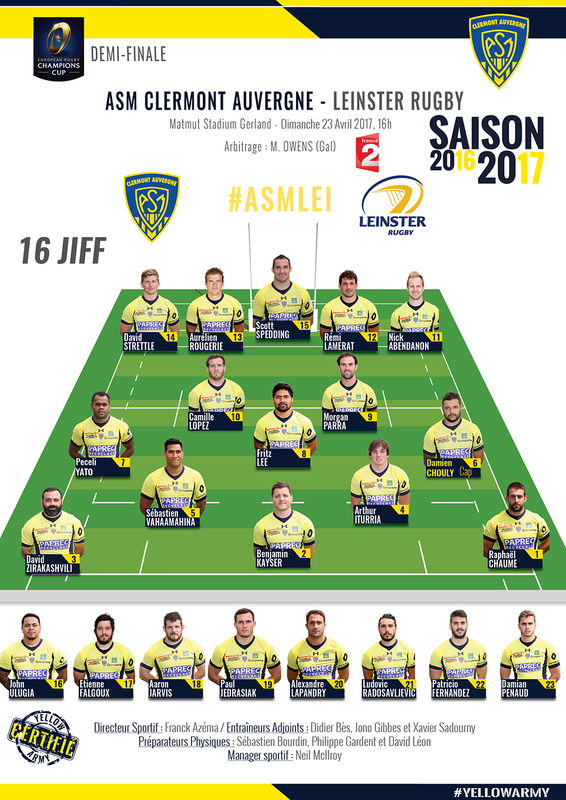 Look at Josh van der Flier...played out of his skin in Galway last weekend and can’t even start with Seánie and Jamie both unavailable. That shows what kind of season Dan Leavy has had and he is well able to stand up to the Damien Choulys and Fritz Lees of this world, as are Rhys Ruddock and Jack Conan. Predictions? Yikes. Bookies say Clérmont by four. 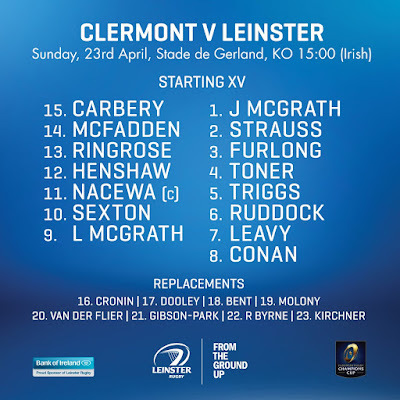 I’m going with my heart, just - Leinster by two. It promises to be an amazing afternoon, one I am going to have to miss as it happens. No complaints from me though...the match falls on my son’s 8th birthday and I’m not missing that for the world. Just be sure and cheer a little louder on my behalf and spare a thought for me watching Boss Baby and munching burgers in Eddie Rockets trying desperately to avoid glancing at my phone or overhearing the score before I get to watch later that evening! Bon voyage to all travelling to France - strange times over there now with elections and everything else; hopefully we’ll be able to keep our attention firmly on the rugby.